Oh, I love macaroni and cheese! And Macaroni or pasta salad is just as good! 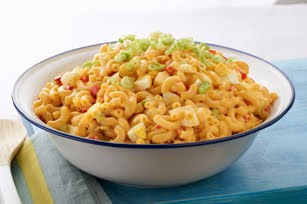 I found this new version, well new to me, of a macaroni salad on Kraft Food and wanted to share it with all of you for today's Tasty Tuesday. -PREPARE Dinners as directed on package. -ADD remaining ingredients; mix lightly. Sounds yummy. I will have to give that one a try. Sounds tasty with the addition of the red pepper. I'll have to give that a try. I like to add a dry package mix of onion soup mix to my mac salad.